^ 开罗宣言內容. 日本国立国会图书館. November 27, 1943. ^ 開羅宣言資料與解說(包括簡介，原件影印檔，收藏地，檔案文號). 日本国立国会图书館. December 1, 1943. ^ 林滿紅. 我國與聯合國關係之前瞻 (PDF). 中央研究院週報 (臺北市: 中央研究院). 2007年11月1日, (1144) [2014年11月29日]. （原始内容 (PDF)存档于2014年11月11日）. ^ 邱燕玲. 邱吉爾外孫女：是新聞公報非協議. 自由時報. 2013年12月2日 [2015年2月6日]. ^ Drew Middleton. Cairo Formosa Declaration Out of Date, Says Churchill. United States: New York Times. February 2, 1955 （英语）. ^ FORMOSA (SITUATION). hansard.millbanksystems.com (© UK Parliament). 1955-02-01 [2015-08-15] （英语）. 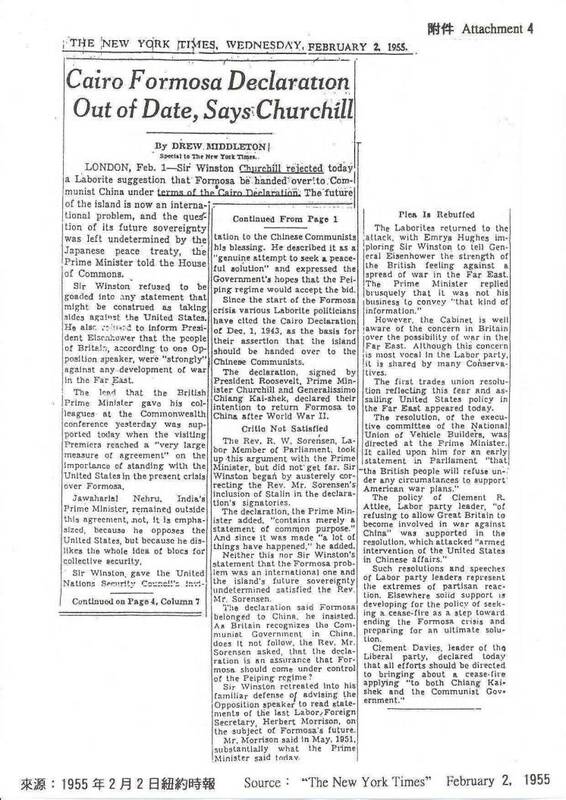 ^ HC Deb（英语：Hansard） 04 May 1955 vol 540 cc1870–1 （英文）. "The document in question was the Cairo Declaration. That was couched in the form of a statement of intention, and as it was merely a statement of intention, it is merely binding in so far as it states the intent at that time, and therefore it cannot by itself transfer sovereignty......The case of Formosa is different. The sovereignty was Japanese until 1952. The Japanese Treaty came into force, and at that time Formosa was being administered by the Chinese Nationalists, to whom it was entrusted in 1945, as a military occupation......That position has been made quite clear by the statement the Prime Minister made in the House on 4th February, which has been quoted by the hon. and learned Member. Therefore I shall not repeat it." ^ 王景弘. 馬英九的謊言改變不了史實. 自由時報 (臺北市). 2013年12月8日 [2015年5月7日]. ^ 글로벌 세계 대백과사전(n.d.). “카이로 선언”. 《글로벌 세계 대백과사전》. 2017년 11월 19일 확인함.